You gotta have people looking’ out for you in this word, or you’re gonna get crushed. It’s just a fact-if you’re going it alone, it’s tough sledding almost all across the board. We aint living in easy ‘ol caveman times, when life decisions consisted of “how fast do I run away from this huge bear dog thing?” or ” I really shouldn’t eat another rib off this weird running monster chicken, but what the hell-I deserve it! Nope. No such luck. That’s why I got peeps from here to Germany, from Canada to Mexico, and all the ins betweens, lookin’ out for new candy to share. It’s called a COMMUNITY people. Oh looky! 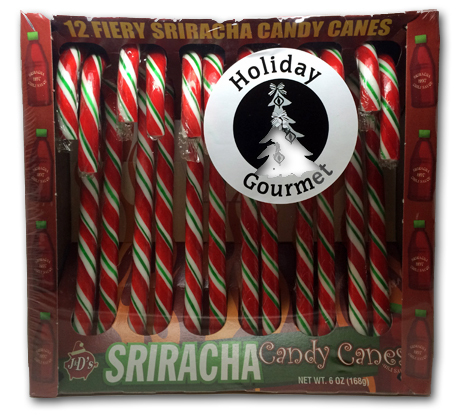 Sri Racha candy canes! My friend April, as well as all of you by now, know that me and Matty both are addicted to Sri Racha. Me in particular. I buy a new large bottle at least three times a year. That’s a lot of Sri. I put the crap on everything savory, except oddly, pizza, which it even recommends on the bottle. I don’t mess with my pizza. It’s almost as important as candy. But on everything else? Slop it on. However, I was nervous about these, as I already reviewed a Sri Racha lollipop made by our friends at Lollyphile. They rock bells to be sure-they’re doing things I haven’t even thought of yet, and doing them well. But I didn’t like their Sri pop, only because…to me, it didn’t taste like Sri Racha. Just a mildly spicy and sweet lollipop. But this review isn’t about those things- it’s about these canes baby, yeah! It’s the holiday season! So here’s the deal on these: They don’t taste like Sri Racha. At all. 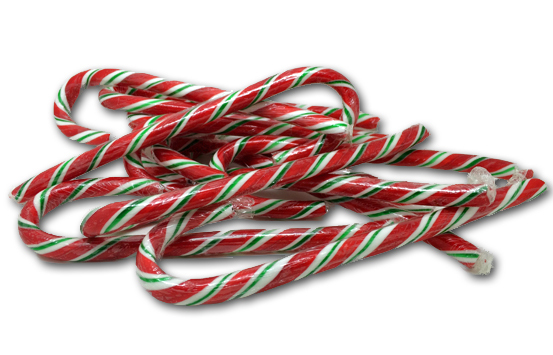 They’re just…a sweet candy cane that actually has a decent little spice kick. The taste is way closer to cinnamon than anything else. So um..yeah-I guess they are similar to the Sri Racha lollipop we reviewed. Different in that they taste like cinnamon, but samey in that they don’t harken their namesake’s flavor at all. I don’t get it. If you’re gonna go for it, go for it, damn it! Where’s the garlic? Where’s the real chile punch? Where’s the salt? It’s not that hard-Sri Racha doesn’t have that many ingredients. Regardless, these are a fail. Jonny Guru Jr. likes them, but that’s because he’s a cinnamon freak. Hey, idea! They could rebrand these as Big Red® candy canes! If they did that…they’d have fewer disappointed consumers on their hands. Even worse, these things are priced RIDIC. Way too expensive. Having said that – click the link below and (don’t) buy some today! You know Sriracha is getting kicked out of their home town because the natives can’t breathe with all the peppers in the air. That’s all. No, they’re not. They’re just being forced to reduce the “pungency” of the fumes they output.